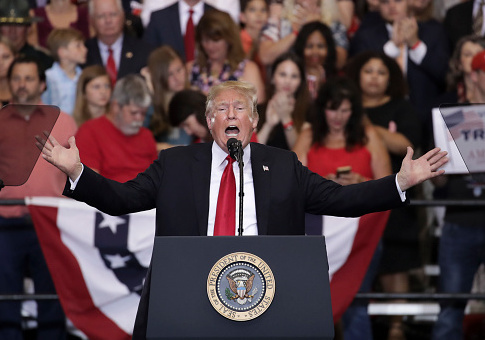 President Donald Trump on Wednesday praised Republican candidates for their success in California's primary election Tuesday night and predicted there "may be a big red wave" come November. Democrats have been long-predicting there will be a major "blue wave" in the midterm elections this fall, but Trump pushed back by saying Democrats are "easy to beat." GOP gubernatorial candidate John Cox came in second in the primary election, securing a spot to face off against the Democratic frontrunner, current Lt. Gov. Gavin Newsom. In California's "jungle primary" system, the top two candidates in the primary advance to the general election, regardless of party affiliation. Trump later added his congratulations for Rep. Dana Rohrabacher (R.), the incumbent in California's 48th Congressional District race who won the primary on Tuesday. Rohrabacher will face a to-be-determined Democrat in the November general election. Trump also tweeted about voter turnout in California's jungle primary races, saying, "more Republican voters showed up yesterday than the Fake News thought possible." "Many more Republican voters showed up yesterday than the Fake News thought possible. The political pundits just don’t get what is going on out there – or they do get it but refuse to report the facts! Remember, Dems are High Tax, High Crime, easy to beat!" Trump tweeted. Many more Republican voters showed up yesterday than the Fake News thought possible. The political pundits just don’t get what is going on out there – or they do get it but refuse to report the facts! Remember, Dems are High Tax, High Crime, easy to beat! The Washington Post reported that Democrats "barely" avoided a disaster in three Orange County-area House races that are critical for them to take back the House in November. While results show Democrats will most likely finish second in the primaries for three Republican-leaning races — the 39th, 48th and 49th districts – thus ensuring a Democratic candidate will be on the ballot come November, it's not clear the party will be able to get every win it's looking for. This entry was posted in Politics and tagged 2018 Election, California, President Trump, The Washington Post. Bookmark the permalink.